On this trip I made a conscious effort to trust myself and the Leica M6, I didn't shoot loads of film, just 3 rolls of Portra 400 and I didn't capture these images digitally so it was a case of having a little faith and crossing my fingers. I have to say I'm a touch nervous about showing these and I'm certainly not saying "look at my film shots they are wonderful...." that said what is important is that overall I'm happy with them. 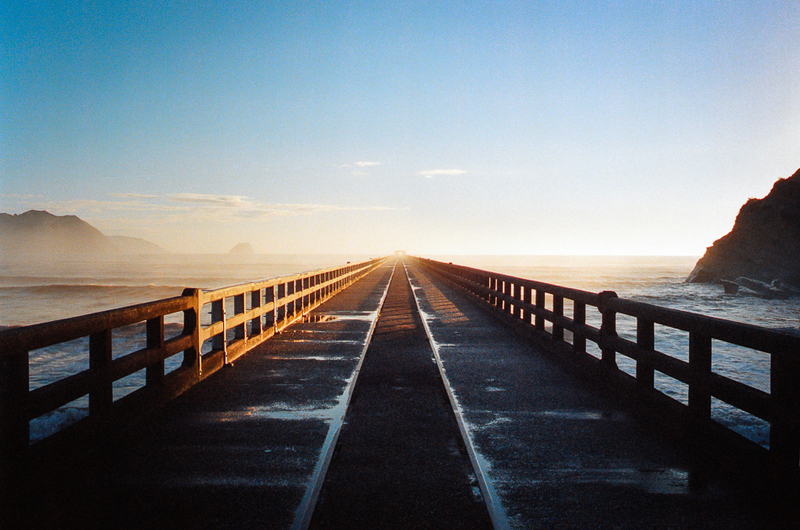 Shooting film does encourage you to think more and press the shutter release less which can't be a bad thing. 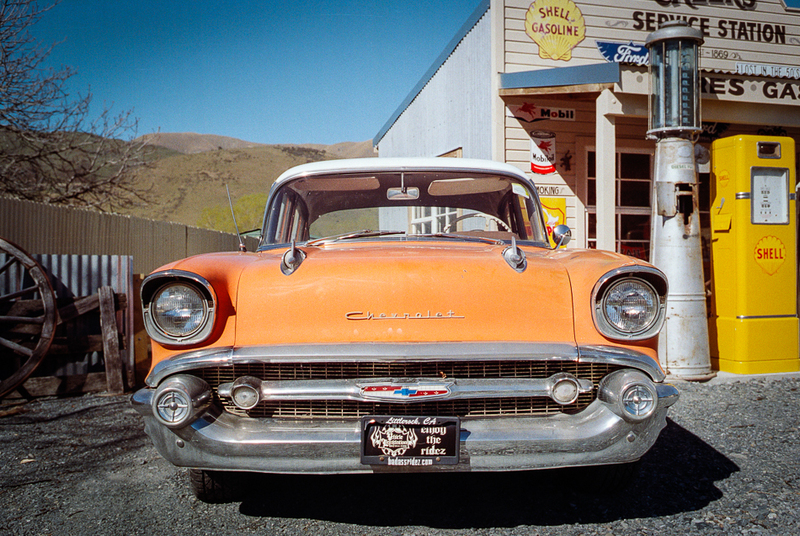 It's important to add I'm still building up an understanding of Portra 400, certainly my decision to rate it at ISO 200 has released a little of the magic you hear people refer to when discussing their experiences with this film. SCANNER - Reflecta Proscan 7200 - I've been absolutely delighted with this scanner, it's cost effective and most importantly has allowed me to achieve the kind of resolution and detail I'd been missing in my film scans. If you need a dedicated 35mm film scanner I can't recommend this highly enough. I can safely say there is pretty much nowhere in the South Island I have not been, with the exception of Milford Sound which was another destination I almost made it to, only to be thwarted by land slips and blocked roads. Just a snap but this was my little home while on the road, definitely the best way to see NZ although that is based on there being only myself in the van. I can't help but think many a friendship or relationship has ended after sharing one of these for a prolonged period!! Ha, ha. Another snap, again just trying to build up a firm understanding of the film characteristics, I've bought some Kodak Portra 160, Kodak Portra 400 and Kodak Portra 800 in 120 so I'll be looking to use that in the Contax 645 and get some portraits done. I had hoped to use this image in my Quake City post but the film wasn't back from the developers and my lack of patience got the better of me. 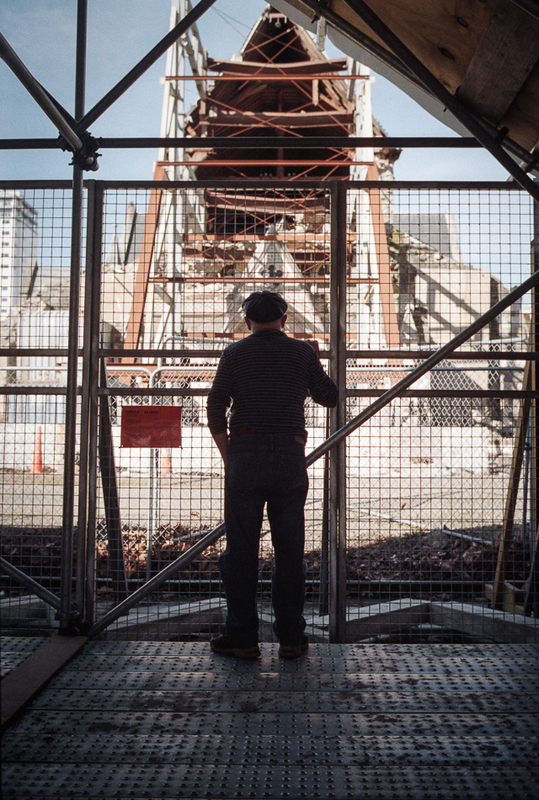 I much prefer this shot to the one I used, the posture of the old guy and the lighting are much stronger in this image. The verstility of Kodak Portra 400, it may be more conventional to use Ektar 100 for a shot like this but I like the tones from the Kodak Portra 400. 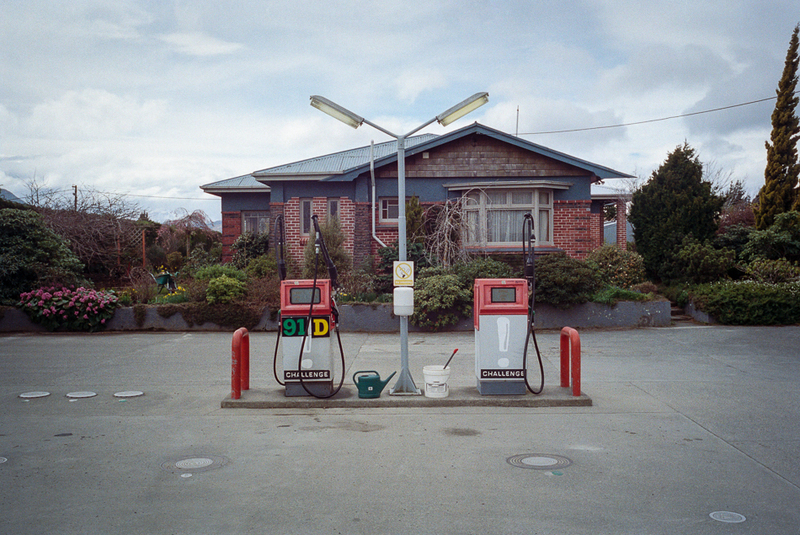 There are probably many similar Petrol Stations in NZ, quaint.....I have no idea why but the image makes me smile. As I drove in to Mossburn a sign at the roadside caught my eye, it read - Mossburn, Beer Capital of New Zealand. This was new's to me but I was quite happy to hang around town and give it the benefit of the doubt!! However when I reversed to look at the sign again it actually read - Mossburn, Deer Capital of New Zealand......not quite as appealing. Giant backlit doughnuts don't make great subject matter, I've shared this because I love the way small town NZ makes the most of what it has, this sits in the centre of......yes, you guessed it, Springfield!! The town seems to have firmly embraced the Simpsons and in turn I was happy to embrace my inner Homer!!! Thankfully they've stopped short of declaring it the "Simpsons Capital of the World" which I'm pleased about!! This strange phenomena is adopted by many towns here, for instance Queenstown - Adventure Capital of the World, Te-Puke - Kiwi Fruit Capital of the World and even Taihape - Gumboot Capital of World.......there are many more!! In my post Film Heaven or Hell I highlighted my frustrations with scanning using the Canoscan 9000f (now departed) it's great to finally be looking at images with kind of resolution and detail I'd always hoped for but couldn't achieve with my previous scanner. The Reflecta Proscan 7200 is an excellent dedicated 35mm scanner, I will get around to doing something more detailed in time. I'm pleased with this image, we're lucky as photographers that we take the time to see, I mean really see. It's always satisfying to make something beautiful from a scene most people would drive straight past. 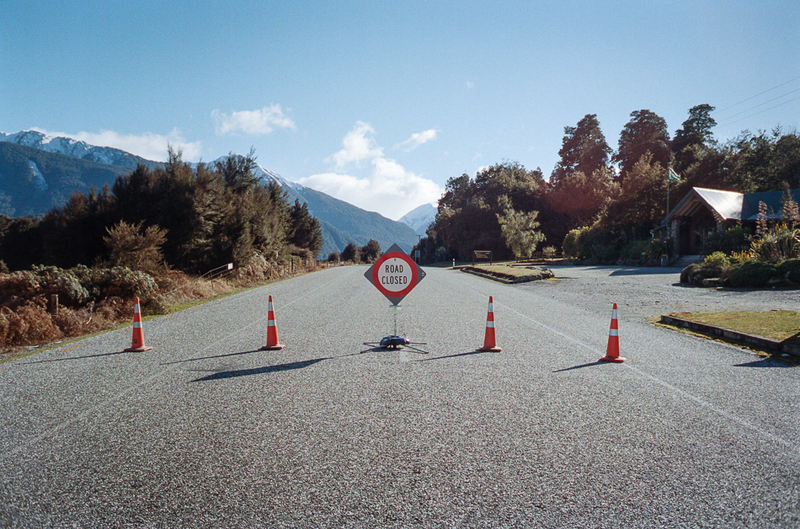 The drive from Wanaka to Haast is 140km's of beautiful road, unfortunately for me I hit this roadblock about 60km's away from my destination due to a massive slip. 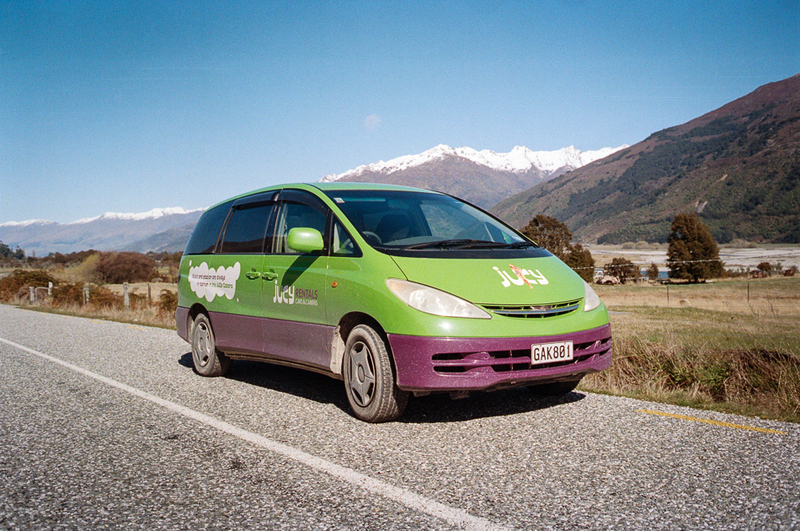 There is only one other way to get to Haast and it involves a 1000km detour, determined to reach my original destination that's exactly what I did. Tragically, at the time I was stuck here people were yet to realise that two Canadian tourists had been killed when their camper van was swept off the road and in to a river by another slip in this pass. If you know anything about NZ you'll know that this isn't in the South Island, it's actually in Tolaga Bay and therefore it's rightful place would have been in my Bouncing Back the East Cape Revisited post. Because it was actually the only frame used on the roll of film already loaded in to the M6 it's appearing here. These few rolls of Kodak Portra 400 have certainly given my desire to shoot film a shot in the arm, whats more its clear to me that the more experience you gain with film the more you realise there is to learn.